This mac and cheese is easy to make, has a rich flavor, and a smooth and creamy texture that isn't overly heavy and gooey. The secret? A blend of mascarpone, cottage cheese, and gruyere cheese. 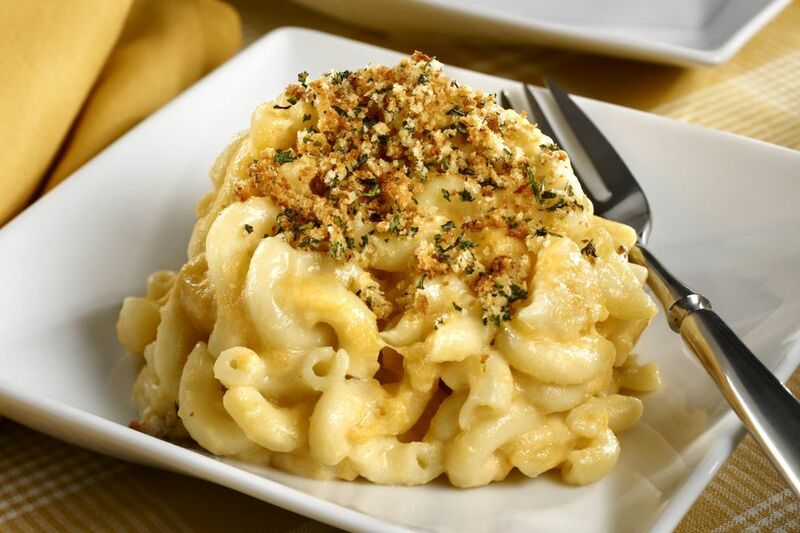 The mascarpone and cottage cheese melt completely into the noodles, giving the macaroni and cheese a creamy texture without having to deal with a flour and butter based sauce. No one will ever guess mascarpone and cottage cheese are the secret ingredients. The gruyere brings bold, sharp flavor to the dish and keeps the texture smooth, not grainy. Large elbow macaroni is larger and there is more room for the cheese to get inside and flavor the noodles. Every noodle is filled with cheesy goodness. The inside of small elbow macaroni noodles don't fill up with cheese, it remains on the outside, and the result is a dish with inferior flavor and texture. Oil or butter an 8x8 (2 quart) baking pan. Drain the noodle and rinse well; leaving too much starch on the noodles can make the finished baked macaroni and cheese taste bland. In a large bowl, mix the cottage cheese, mascarpone, gruyere, eggs and 1/2 teaspoon of the salt. Add the noodles to the bowl, mixing well, so the noodles are evenly and completely covered with the cheese and egg mixture. Spread the noodles evenly into the baking pan. In a small bowl, mix the remaining 1/4 teaspoon salt with the panko and olive oil until the breadcrumbs are evenly coated in the oil. Sprinkle the panko on top of the noodles. Bake, uncovered, for 40 minutes. If the panko topping is not brown and crispy, put the broiler on for the last few minutes of cooking time to make the top brown and crispy. Once out of the oven, let the baked macaroni and cheese rest for 10 to 15 minutes before cutting into it.